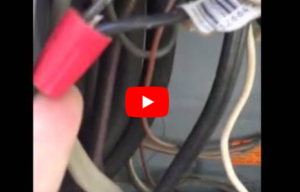 I find problems with many of the Water Heaters during inspections. The most common problems is that there is not a pan under the unit to capture potential leaks or the pressure relief line is not plumbed correctly. Other problems range from bad/missing expansion tanks, loose vent stacks on gas units, improperly vented spaces for gas units, etc. The above picture was taken on an inspection preformed by N-Spec Home Inspections. 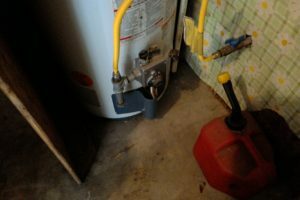 This unit has an improperly plumbed pressure relief line, no stand for the unit, and the obvious gas can sitting right beside a functioning unit. This was an explosion waiting to happen! Most all water heaters follow basic installation procedures that are not followed by the individual installing the unit. These measures are implemented for a reason. Not following the proper installation requirements may cause harmful complications to individuals and the home. Be sure to have your home inspected by a qualified/licensed inspector before purchase or before placing it on the market for sale. Identifying problems ahead of time with your home can greatly mitigate problems with closing. Call us today to set up your Home Inspection we are an ASHI (American Society of Home Inspectors) certified company and check out our 100+ reviews. ← Should I have a Home Inspection?